I’ve been very fortunate to coach a lot of soccer players over the last 15 years and while player personas have been around for a long time, I have developed my own personas as a guide to help me be the best coach I can be to the players in my care. I call these personas The Player, The Coach, and The Warrior. About the personas – no one is simply one of these personas, rather they are a blend of the three, but as a coach and a parent understanding a players dominate persona is important to get the most out of their ability and provide them with the very best playing experience. I’ve seen a lot of damage done to kids when they are asked to be something they are not. Can the qualities in these three personas be taught? Can they be developed? There is a lot of debate around what can and can not be taught or developed in soccer, especially when it comes to the “intangibles” like the will to win or toughness found in The Warrior. In this post I won’t get into what can and can’t be taught or developed, as I would first like to define each of these personas and help parents and coaches understand how important it is to recognize which of these personas best fits your child. Before we dive into the personas I should probably give you some background on me – when I played when I was young (and for about 5 years after college) I was The Warrior. Looking back, I wish I would have been The Player or The Coach (or would have had coaches who helped me develop those areas of my game), but I enjoyed being The Warrior. As I got older I transitioned into The Coach and eventually The Player, and while I will attempt to suspend my own experience as I write, it can’t help but influence why I’m writing what I’m writing. Please forgive me if my writing comes across as myopic or subjective. Final note – I can still channel the The Warrior once in a while, but in a much healthier way now. My hope is this blog post will help you understand yourself, your child, and/or your players better. The Player plays soccer because they love the game. They can’t get enough of it. They are addicted to the sheer joy of the ball at their feet. They lay their uniform out the night before a game. They sign themselves up for soccer camp. Their idea of a summer vacation is a soccer tournament played on perfect grass fields with fresh white chalk, but they will play on any surface as long as there is a game. They love the feeling of the ball hitting their sweet spot and knowing their shot is going to beat the keeper before it even leaves their foot. They dummy the ball, they take risks, they try new things, they watch the pros but would rather be playing, they smile when they do something good, they are ecstatic when they win and sometimes cry if they lose, but not very often. Why would you cry when you just got to play soccer? The Player loves to play and by some series of fortunate circumstances someone fostered that love, protected it, honored it – please understand the distinction – someone fostered, protected, honored THE LOVE of the game, not the results. For The Playing, playing soccer is THE GIFT – it is where they express themselves, it is their canvas, their instrument, their pen and paper. The Player is usually the best player on any team – and by best I mean technically and tactically – because they have gotten more touches on the ball than The Coach and The Warrior because they just love to play. If you have a Player, be patient and be thankful – and remember, your most important job is to foster, protect, and honor their love for the game. 1. Affirmation – The Player wants to know you are watching; they want to know you recognize their gift. They would play even if you weren’t watching, but they will play out of their minds if they know you are. Tell them “good job!” when they do a good job, they take a lot of joy in feeling like they have a special gift – because they do. 2. Time – The Player will need time to play soccer to their hearts content. Make the time. Make soccer a priority to you. Sign them up for all the soccer camps you can. 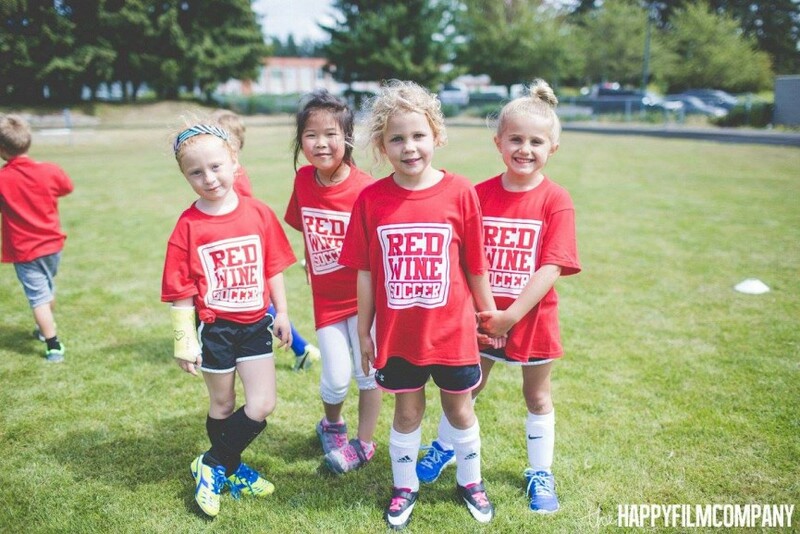 Try not to pile up “other good things” for The Player to do, or force some sort of “balance” because other parents don’t understand how much your kid loves soccer – let soccer be “their thing” and be proud of that with them. 3. Perspective – Their love of the game can fade if it isn’t fostered. And DO NOT confuse their love of the game with having to be on “the best team” or win every time they play; that will be tempting, but don’t do it. Let the game come to them a little bit. As they get older help them navigate the choices of rec, select, and premier, but don’t assume they want to play on the “best team” just because they are a good player. They are good because they love to play, not because they necessarily want to win every time they play. If you are a coach or have ever coached, it is pretty easy to spot The Coach on your team. They ask questions, they have their own ideas for games and drills, they always have something to say at halftime and sometimes it is pretty good. They love the chess game, they understand risk vs. reward better than most of their teammates, and depending on their personality they will want their team to risk a lot or play conservative. The Coach will expect the best out of their teammates and has a tendency to get agitated with The Player or The Warrior if they don’t play within the structure they believe gives their team the best chance to win. You might argue The Coach is one of the most important personas to have on your team; they are the glue, they are the engine, they are not always the most popular, but they love leading a group toward a common goal (no pun intended ha!). At the younger ages it is important to recognize The Coach will not always be your best athlete or as good as The Player, but that doesn’t mean they aren’t important – they are very important and every good team has a Coach. 1. A Voice – let The Coach express himself/herself. Balance your feedback, insight, and instruction for your team while letting The Coach share their thoughts as well. Don’t laugh or roll your eyes if their suggestion is dead wrong (sometimes it will be), that is how they learn, rather restate your reason in a different way that doesn’t make them feel belittled or not heard. 2. Books! Give The Coach a book to read about leadership and coaching that is age appropriate and engaging (it doesn’t have to be a book about soccer coaching). Introduce them to Wooden, Anson Dorance, and Pete Carroll. Let them know becoming a great coach is just as important as becoming a great player – because let’s face it, most of the great coaches weren’t the greatest players and we’ve all seen great players fail as coaches. Invest in their ability to coach and encourage it; tell them “you’re going to be a great coach someday.” Say the actual words and thank them for helping you coach the team. 3. Balance – The Coach has a tendency to take every leadership opportunity – make sure they aren’t dominating those moments. Give them a special assignment like, “Hey Sarah, can you really encourage Alexa to keep shooting today and to have fun. I’m going to put her up top and I just want her to play with confidence and she needs to know her team is supporting her even if she doesn’t score a goal today.” The Coach loves a special assignment. Ahhhh, The Warrior. What can I say about The Warrior without telling war stories about my own playing days? LOL! One way you know you have a Warrior on your hands is when they get hit in the face with the ball and keep going like nothing happened. The Warrior takes pride in their toughness – what would make other kids crumble to the ground and cry is their chance to show everyone how tough they are. The Warrior will also do whatever it takes to win and does not do well if they lose. Their sense of injustice is at an all-time high and they will get frustrated very quickly with a ref that confuses their athletic ability and physical play for a “foul.” The Warrior isn’t always the best player, but they are usually a strong athlete with good size and they can make the biggest impact, especially at the younger ages. If you have a Warrior, hope and pray their Warrior spirt rubs off on your Players and your Coaches, because it will only help everyone play better. The competitive fire a Warrior is something that can carry a team farther than talent alone and that is not a cheesy cliche – my best teams were made up of some amazing Warriors and their Warrior spirit influenced the entire team. *Special shoutout to Taylor Thomas for being my all-time favorite Warrior. 1. Limits – Don’t allow The Warrior to be dirty or use their physical strength in a reckless way. Teach them that they are athletes first and have been given a gift of using their body to impact the game in a special way. 2. Technical Repetition – Because The Warrior is already…well, a Warrior…you don’t need to encourage them to play physical or tough – you need to encourage them to tackle correctly, go shoulder to shoulder correctly, and position their body in a way that is effective when shielding the ball or going in for a 50/50 ball. There is technique to a good tackle. There is technique to moving someone off the ball with your body. Team them these techniques and send them links to videos of players who do it well (Jermaine Jones, Abby Wambach, etc.) Also, don’t forget to foster their technical ability in terms of first touch, striking the ball, and other dribbling – give them some finesse to go with their power and watch out! 3. Praise – A lot of parents (and even coaches and refs) who don’t have a clue about soccer will tell Warriors to “calm down” or to “take it easy.” If your Warrior is playing clean and within the laws of the game, but is just bigger, faster, and/or better at using their body to win tackles and 50/50 balls, they need to know you have their back. Soccer is a physical game, unfortunately people get hurt playing soccer, and sometimes The Warrior will hurt people and sometimes they will get hurt – that is just part of the game. Tennis and golf are great games, but soccer is the only game your Warrior will want to play if they are recognized for their athleticism and courage. Copyright 2018 Redwine Soccer. All Rights Reserved.